Paris Climate Change Agreement: India's Ratification Brings Deal Close To Binding : The Two-Way Sixty-two countries have now joined the plan. Together, they account for about 52 percent of global emissions, which is a little short of the 55 percent threshold to make the agreement binding. 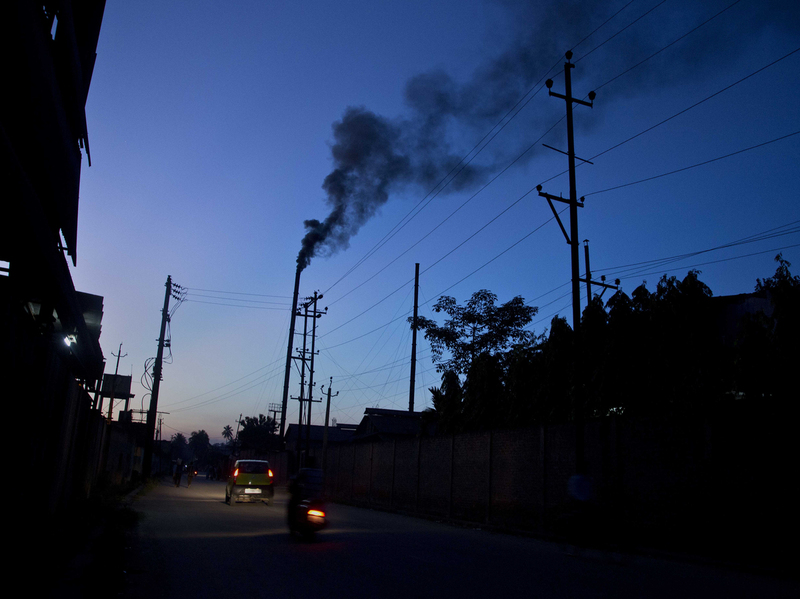 The smokestack of a factory on the outskirts of Gauhati, India, on Sunday. India has formally joined the Paris climate change agreement, handing over its country's official ratification documents to the United Nations on Sunday. India's ambassador to the U.N., Syed Akbaruddin, smiled as he delivered the ratified agreement to the international body's office of legal affairs. The ceremony was held in front of a banner depicting Mahatma Gandhi and recognizing Oct. 2, the Indian peace leader's birthday, as an international day of nonviolence. Indian Prime Minister Narendra Modi, who chose the date purposely, referenced Gandhi in a celebratory tweet. The climate change plan was initially agreed upon by more than 180 countries at the Paris climate conference in 2015, but under its terms, it will not become binding until it is ratified by 55 countries that contribute a total of at least 55 percent of global greenhouse gas emissions. The 55-country requirement has already been fulfilled — India is No. 62 — but the emissions percentage still falls short. Even with major polluters like the U.S. and China signing on early, and including India's addition, the current signatories account for about 52 percent of global greenhouse emissions, according to a statement released by the U.N. on Sunday. India currently produces about 4.5 percent of the world's greenhouse gas emissions, and the country is developing quickly. The Paris agreement requires all countries who ratify it to come up with a national plan to limit global temperature rise, and as part of its plan India has set a goal of producing 40 percent of its electricity with non-fossil fuel sources by 2030. India also promised to plant or preserve enough tree cover to act as a sink for at least 2.5 billion tons of carbon dioxide, and has called on the U.S. and other fully developed countries to share technologies that help decrease emissions. U.N. Secretary-General Ban Ki-Moon released a statement congratulating India and thanking the country for it's "leadership" which he said "moves the world an important step closer" to making the international climate agreement binding. At last month's U.N. General Assembly, Ban pushed for member countries to accelerate their domestic political agendas in order to join the agreement as quickly as possible. His term as Secretary General ends this year and once the plan goes into effect countries that have ratified cannot exit the agreement for four years, which would make it more difficult for the next U.S. administration to reverse policies and promises made by President Obama. The United States officially ratified the Paris climate agreement in September. Of the top 10 global emitters of greenhouse gases according to the 2015 Paris conference, only the U.S., China and India have submitted their ratification documents. Among the top global emitters of greenhouse gases, the 28 countries of the European Union — which is counted as one entity for the purposes of the treaty — and Russia have yet to officially agree to the plan. A previous version of this post incorrectly referred to Narendra Modi as president of India. He is prime minister.